Roscommon 2-10 Mayo 1-9 (Kiltoom, 3/2/1980). MAYO: M Webb; M Gavin, W Diskin, P Burke; H Gavin, A Garvey, M O’Toole; M Carney (0-1), S Minogue; G Feeney (0-1), JP Kean, M Flannery (0-1); K Dermody (0-4, two from frees), J Burke (0-1), J McGrath (1-1). Subs: G Cuddy for Feeney, S Sweeney for P Burke. FIRST ROUND: Sligo 1-7 Mayo 2-11 (Markievicz Park, 8/6/1980). MAYO: M Webb; M Webb; M Gavin, W Diskin, M O’Toole; H Gavin, S Sweeney, G Feeney (0-1); D Dolan, TJ Kilgallon (0-1); WJ Padden, J Maughan, M Carney (0-4); T O’Malley (1-2), J Burke (0-1), J McGrath (0-1). Subs: G Farragher (1-1) for Dolan, G Cuddy for Padden, S Minogue for Sweeney. SEMI-FINAL: Mayo 1-17 Leitrim 1-8 (St. Tiernan’s Park, Crossmolina, 22/6/1980). MAYO: M Webb; M Webb; M Gavin, W Diskin, M O’Toole; L Donoghue, S Sweeney, G Feeney; D Dolan, TJ Kilgallon; M Carney, J Maughan (0-1), G Farragher (0-4); T O’Malley (0-3), J Burke (1-1), J McGrath (0-8). Subs: S Minogue for Sweeney, WJ Padden for Carney. FINAL: Roscommon 3-13 Mayo 0-8 (Dr Hyde Park, 13/7/1980). 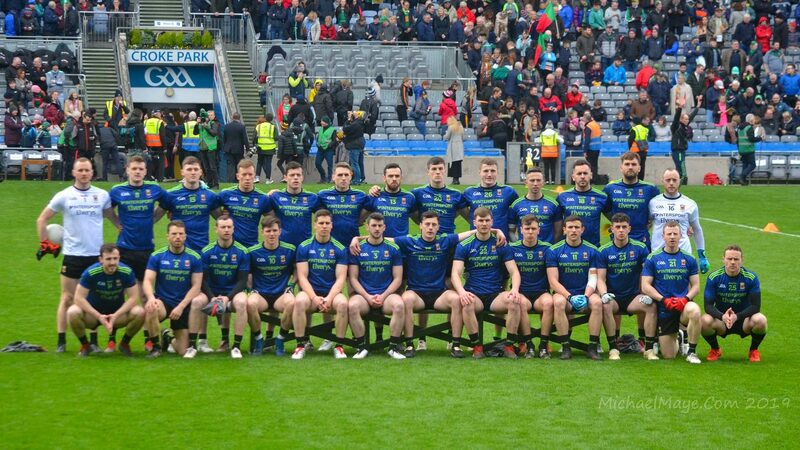 MAYO: M Webb; M Gavin, S Minogue, M O’Toole; H Gavin, W Diskin, G Feeney; D Dolan, TJ Kilgallon; M Carney (0-2, one from a ‘50’), J Maughan, G Farragher (0-1); T O’Malley, J Burke, J McGrath (0-5). Subs: G Cuddy for Farragher, J Gallagher for Minogue, WJ Padden for O’Malley. Meath 2-10 Mayo 3-7 (Pairc Tailteann, Navan, 16/11/1980). MAYO: M Webb; S Minogue, G Golden, M Gavin; H Gavin, T Kearney, L Duggan; TJ Kilgallon (0-1), WJ Padden; G Cuddy (1-1), J Maughan (0-1), M Carney; J Burke (1-0), J Lyons, J McGrath (1-3). Sub: J Fallon (0-1) for Kilgallon. Mayo 2-4 Tyrone 2-4 (James Stephens Park, Ballina, 30/11/1980). MAYO: M Webb; S Minogue, G Golden, M Gavin; H Gavin, G Feeney, M O’Toole; WJ Padden, M Carney; G Cuddy (0-1), J Lyons, S Weir; J Burke (0-1), J Maughan (1-0), J McGrath (1-1). Subs: L Duggan (0-1) for O’Toole, A Egan for Duggan, T O’Malley for Weir. Galway 3-7 Mayo 2-10 (Tuam Stadium, 7/12/1980). MAYO: M Webb; S Minogue, G Golden, M Gavin; H Gavin, T Kearney, G Feeney; WJ Padden (1-0), TJ Kilgallon (0-1); T O’Malley (0-3), J Maughan, M Carney (0-3); J Burke, J Lyons, J McGrath (1-3). Sub: P Dixon for Maughan. Laois 2-4 Mayo 2-8 (O’Moore Park, Portlaoise, 14/12/1980). MAYO: M Webb; S Minogue, G Golden, G Feeney; M Gavin, T Kearney, M O’Toole; WJ Padden, TJ Kilgallon; M Carney (0-3), J Maughan, T O’Malley (0-1); J Burke, J Lyons (1-2), J McGrath (1-1). Subs: S Sweeney (0-1) for Maughan, H Gavin for M Gavin, F Fahy for Carney. SEMI-FINAL: Mayo 3-13 Sligo 4-2 (Ballinrobe, 20/7/1980). MAYO: C Hyland; J Gibbons, G Golden, R Walsh; E Melvin, S Luskin, M O’Toole; WJ Padden (0-1), M Joyce (0-1); G Cuddy (1-5), J Maughan (1-0), TJ Kilgallon (0-4); T Walsh, J Lyons (1-0), B Moran (0-2). Sub: J Flynn for Gibbons. FINAL: Mayo 4-11 Galway 1-5 (MacHale Park, 15/8/1980). MAYO: S Warde; PJ McGarry, G Golden, S Luskin; E Melvin, P Monaghan, M O’Toole; TJ Kilgallon (0-3), WJ Padden; E Macken (0-3), J Maughan (0-2), T Reilly; G Cuddy (2-3), J Lyons, B Moran. Sub: L Lyons (2-0) for Moran. SEMI-FINAL: Dublin 1-13 Mayo 2-8 (Pearse Park, Longford, 28/9/1980). MAYO: S Warde; PJ McGarry, G Golden, S Luskin; E Melvin (0-1), P Monaghan, M O’Toole; TJ Kilgallon, WJ Padden; T Reilly, J Maughan (1-0), E Macken (0-3); G Cuddy (1-3), J Lyons, L Lyons (0-1). Subs: T Waslh for Reilly, L Duffy for O’Toole, T Byrne for L Lyons. SEMI-FINAL: Mayo 2-8 Sligo 0-9 (St. Tiernan’s Park, Crossmolina, 22/6/1980). MAYO: J Reidy; C Dever, P Forde, JJ Gallagher; M McNulty, K Jordan, J Finn; J Maughan (0-1), R Flynn; J Moylette, G Geraghty, S Maher (0-1); J Lindsay (1-0), J Walsh (0-2), K McStay (1-3). Subs: B McDonald (0-1) for Flynn, M Geraghty for Maughan. FINAL: Roscommon 2-9 Mayo 3-8 (Dr Hyde Park, 13/7/1980). MAYO: J Reidy; C Dever, P Forde, JJ Gallagher; M McNulty, J Maughan (0-1), J Finn; G Geraghty, R Flynn; J Moylette (1-0), E O’Brien, T Grogan; J Lindsay (1-1), J Walsh (0-2), K McStay (1-4). Subs: P Collins for Grogan, P McGrath for O’Brien. SEMI-FINAL: Derry 1-11 Mayo 0-11 (Croke Park, 10/8/1980). MAYO: J Reidy; C Dever, P Forde, JJ Gallagher; M McNulty, J Maughan, J Finn (0-1); G Geraghty (0-1), R Flynn; T Grogan (0-2), J Moylette, J Lindsay; P Collins (0-2), J Walsh (0-1), K McStay (0-4). Sub: J Sloyan for Walsh.